1. The periodic classification of the elements is an arrangement of the elements in order of their __. 2. If 1 litre of 2.2M sulphuric acid is poured into a bucket containing 10 litres of water, and the resulting solution mixed thoroughly, the resulting sulphuric acid concentration will be __. 3. In the above experiment (Fig. 1) the litmus paper will initially __. 4. 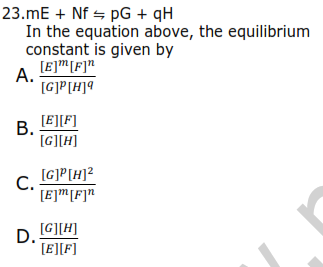 A correct electro-chemical series can be obtained from K, Na, Ca, Al, Mg. Zn, Fe, Pb, H, Cu, Hg, Ag, Au by interchanging __. 5. A basic postulate of the kinetic theory of gases is that the molecules of a gas move in straight lines between collisions. This implies that __. 6. On which of the following is the solubility of a gaseous substance dependent? D. I, III and IV only. 7. Which of the following statements is correct about the periodic table? B. The valence electrons of the elements in the same period increase progressively across the period. 8. The boiling of fat and aqueous caustic soda is referred to as __. 9. Which of the following pairs of substances will react further with oxygen to form a higher oxide? 10. In the preparation of oxygen by heating KCIO3 in the presence of MnO2, only moderate heat is needed because the catalyst acts by __. 11. Methanoic acid mixes with water in all proportions and has about the same boiling point as water. Which of the following methods would you adopt to obtain pure water from a mixture of sand, water and methanoic acid? 12. A quantity of electricity liberates 3.6 g of silver from its salt. What mass of aluminium will be liberated from its salt by the same quantity of electricity? [Al = 27, Ag = 108]. 13. 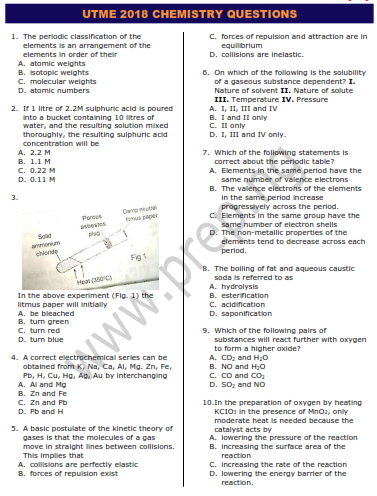 Suitable reagents for the laboratory preparation of nitrogen are __. D. sodium chloride and ammonium diozonitrate (III). 14. The number of electrons in the valence shell of an element of atomic number 14 is __. 15. What volume of oxygen will remain after reacting 8cm3 of hydrogen gas with 20cm3 of oxygen gas? 16. 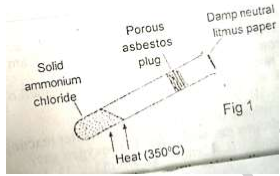 If one of the following oxides is heated with hydrogen or carbon using a Bunsen burner, it is not reduced to the metal. Which one is it? 19. What is the concentration of a solution containing 2g of NaOH in 100cm3 of solution? 20. How many atoms are present in 6.0g, of magnesium? [Mg =24, NA =6.02 x 1023 mol-1]. 21. The radio isotope used in industrial radiography for the rapid checking of faults in welds and casting is __. 22. Beryllium and Aluminium have similar properties because they __. (iii) 4NH3(g) + 3O2(g) 6H2O(l) + 2N2(g). 25. The salt that reacts with dilute hydrochloric acid to produce a pungent smelling gas which decolourizes acidified purple potassium tetraoxomanganate (VII) solution is __. 26. The refreshing and characteristic taste of soda water and other soft drinks is as a result of the presence in them of __. 28. A balanced chemical equation obeys the law of __. 30. According to Charles' law, the volume of a gas becomes zero at __. 32. The Sulphide which is insoluble in dilute hydrochloric acid is __. 33. What is the PH of 0.001 moldm-3 solution of the sodium hydroxide? 34.The type of bonding in [Cu(NH3)4]2+ is __. 35. Which of the following is an example of a chemical change? 36. To what temperature must a gas at 273K be heated in order to double both its volume and pressure? 38. An element used in the production of matches is __. 39. Which of the following gases may not be dried with concentrated sulphuric acid? 40.Consecutive members of an alkane homologous series differ by __.